Dandelion Wine. 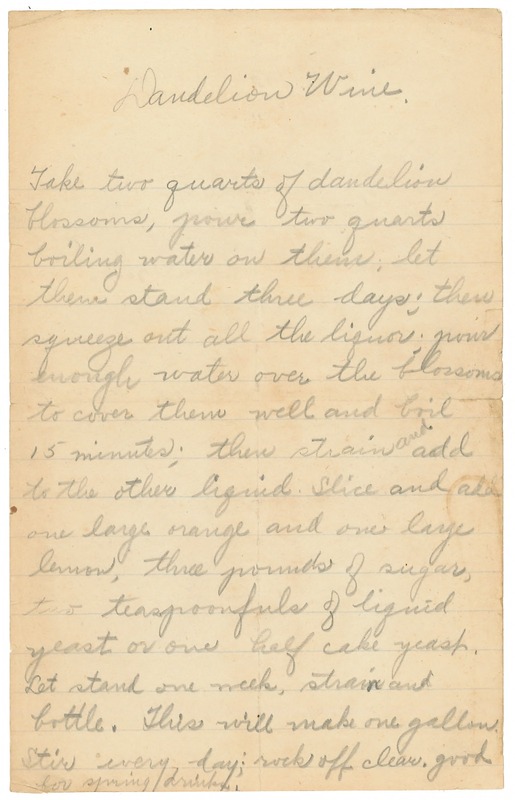 Take two quarts of dandelion blossoms, pour two quarts boiling water on them, let them stand three days; then squeeze out all the liquor; pour enough water over the blossoms to cover them well and boil 15 minutes; then strain and add to the other liquid. Slice and add one large orange and one large lemon, three pounds of sugar, two teaspoonfuls of liquid yeast or one half cake yeast. Let stand one week, strain and bottle. This will make one gallon. Stir every day; rack off clear. good for spring drinks.